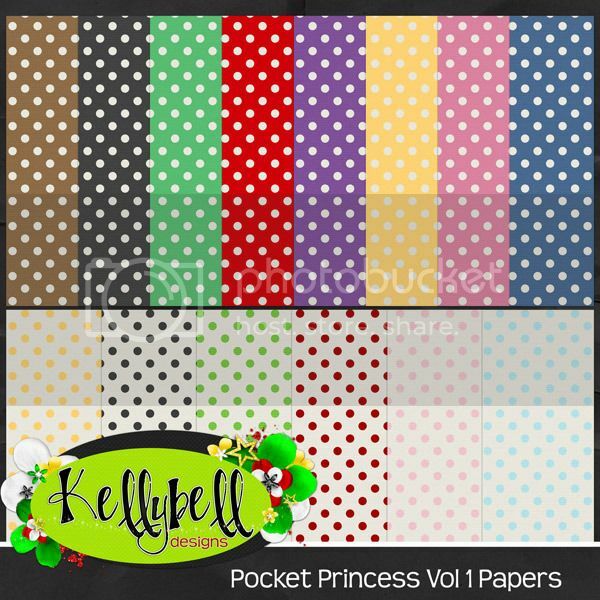 Scrap Out Loud: Pocket Princess from Kellybell Designs! Ever wonder what life would be like if you were a princess? There are lots of princesses to meet at a Disney park. Wouldn't you love to talk to them and find out all about them? These face-characters are in high demand for meet and greets. Meeting Cinderella, Aurora, Belle or Ariel is a dream come true for many girls, young and old. 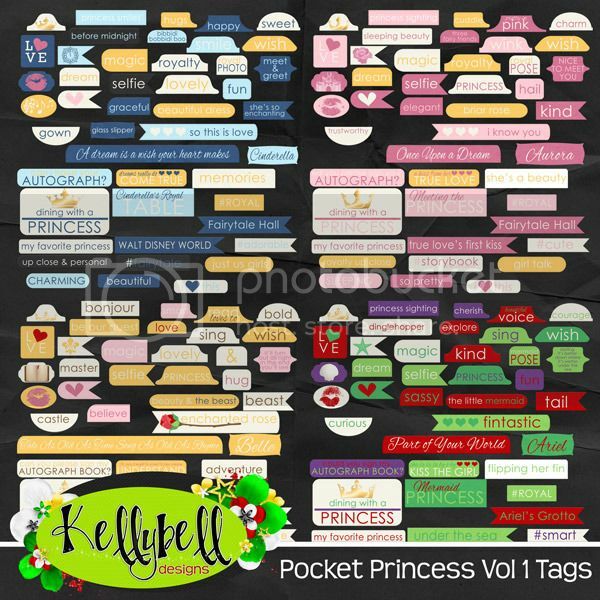 For capturing and recording all those wonderful photo memories, you're gonna need lots of princess kits. 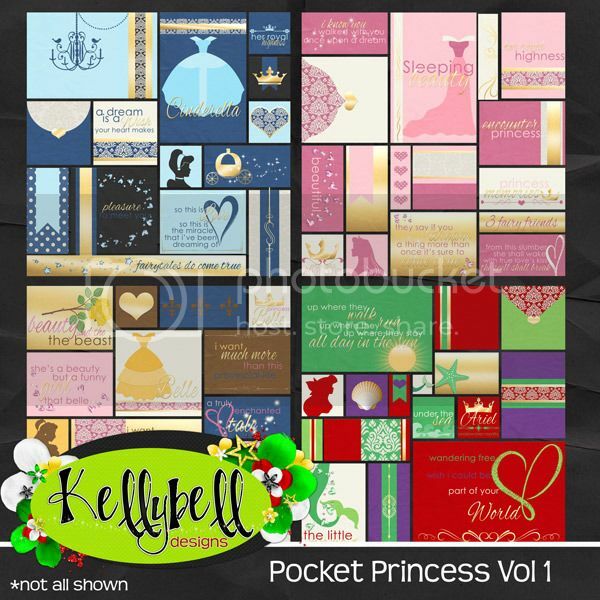 Kelly is introducing a new series today called Pocket Princess. It will give you goosebumps!! Aren't those just precious? There's a set for Cinderella, Aurora, Belle and Ariel. Plus there's a matching set of word tags and journal strips. 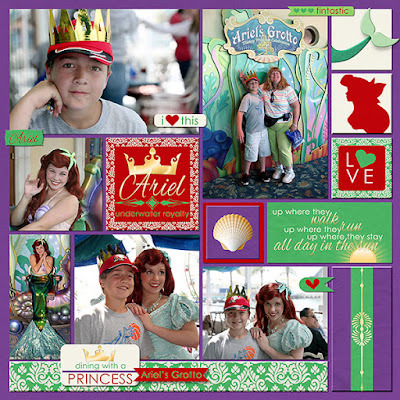 So many ways to decorate your princess pages! Check out the coordinating set of alphas. You'll get 8 alphas in all! Next you'll need some papers. Here's 2 pretty packs to chose from. One with polka dots and one with a floral print pattern. Last up is a set of Pocket Style templates with rectangle corners and lots of blocks for photos, tags, papers and journal cards. All the templates come in PSD, PAGE, TIFF and PNG formats. Wow! What a fabulous set of princess items to choose from. Make sure you purchase these this weekend when the sale price is 25% off. 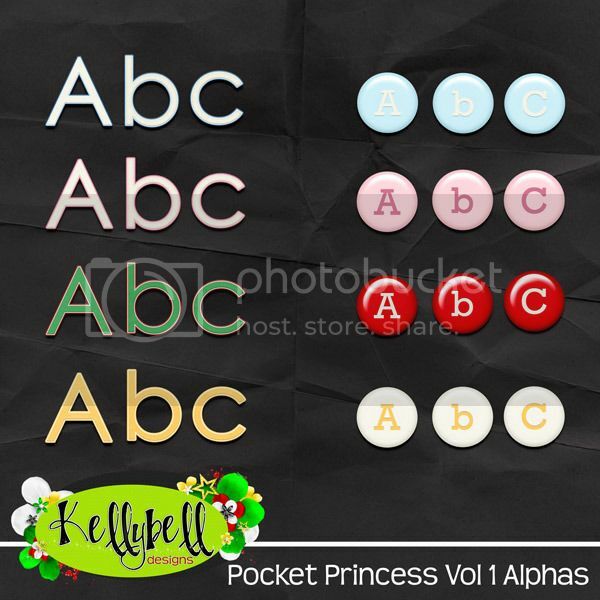 You can find all of these items inside the Kellybell Designs Store. 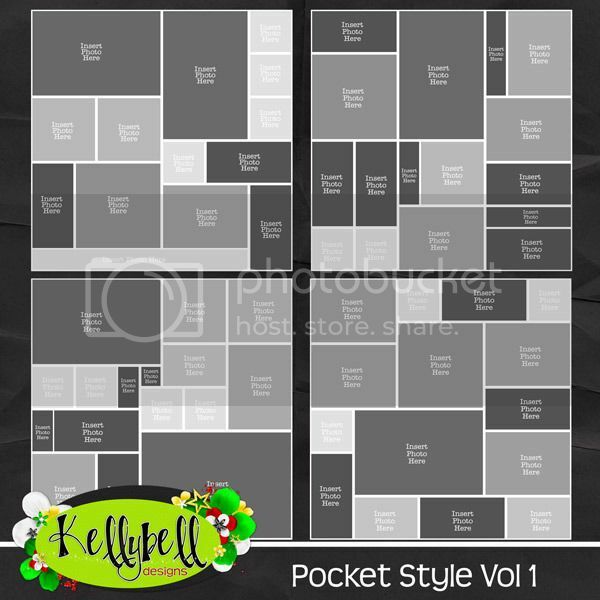 Curious about how you might scrap with these pocket templates or the pocket packs? 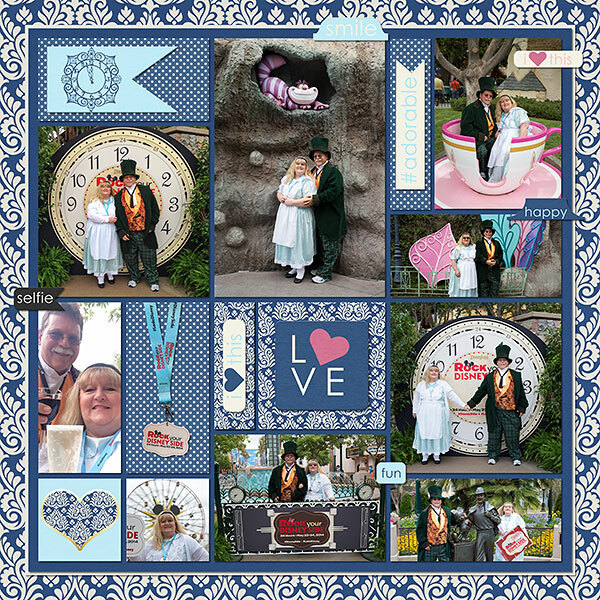 Kelly's Creative Team has so many layouts you can view on Kelly's Blog or Kelly's Facebook Page. 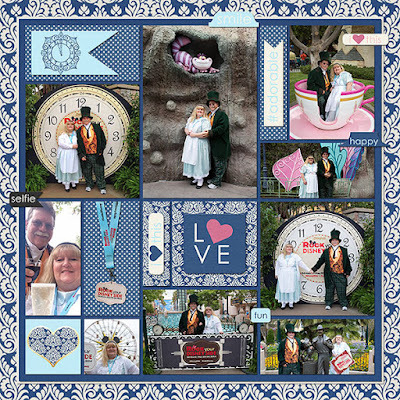 I love these kits so much I made two layouts... one for a character encounter with Ariel and the other using the Cinderella blues but with Alice in Wonderland pictures! Boys won't admit it but they like to meet the princesses too. We took our one of our son's individually to Disney's California Adventure and had lunch at Ariel's Grotto. We had so much fun at "Rock Your Disney Side" 24-Hour event. We dressed up as Alice and the Mad Hatter. People kept taking pictures of us... it was hilarious! Being at Disney in the middle of the night was awesome too! You gotta make it to the bottom of the post to get the coordinating freebies that Kelly's Creative Team gals have made for you. Kinda like you gotta eat dinner before you can get dessert. Here are 3 scrumptious freebies to grab today. Have a wonderful weekend and go Scrap Out Loud!